Olympus Cheese are proudly Mediterranean in our palate, with a range of delicious cheese and yoghurt which salutes a healthy Mediterranean lifestyle. If you want to look and feel like a Greek God or Goddess, then the Mediterranean Diet is a proven way of eating for a long and healthy life. 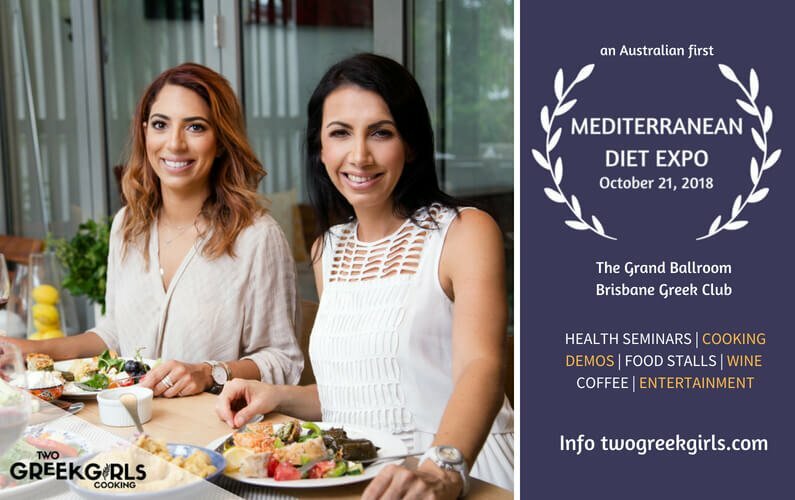 We are proud to join a host of other wonderful producers and fellow Mediterraneans when Two Greek Girls Cooking take over Brisbane’s Greek Club on October 21 for the Mediterranean Diet Expo. 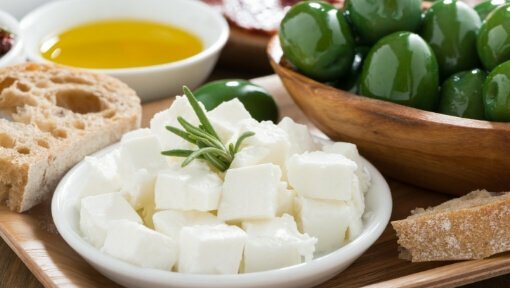 We explore a little more about the diet and Mediterranean cheese and yoghurt in more detail, and why it’s so deliciously good for you. As well, we also let you know what will be in store for you at the Expo. The Mediterranean Diet includes dairy in moderate amounts, generally two serves a day. Cheese and yoghurt is definitely on the menu, and most of the cheese we eat is white or fresh cheese. The freshness of white cheese makes it easier to digest. Traditionally fresh cheese is made from goat and sheep milk, and in Australia, cow’s milk and buffalo milk. It is often eaten simply accompanied by olives, in a salad or with bread and at any time of the day. Cheese delivers a range of nutrients, including calcium, protein, phosphorous, Vitamin A, B2 and B12. Different parts of the Mediterranean make ‘signature’ white cheeses. Greek fetta, Cypriot halloumi, Spanish mato, French chevre, Israeili labane, and Italian ricotta and mozarella. Fetta cheese is well favoured in the Mediterranean diet because of its high probiotic content, as is yoghurt. The type of milk available determines the flavour of the cheese. The distinct flavours change depending on the soil and climate of the area, and what the animal is fed. According to Oldways, The Mediterranean Diet favours the fresh variety particular to each region. In Australia, cheesemakers often use cow’s milk as it is more abundant. This gives it a distinctive flavour unique to the region. We are also more of a melting pot of many cultures and this is reflected in our cheesemaking. For example, Olympus master cheesemaker Michael has both Cypriot and Greek heritage. Paying homage to this, we make halloumi and fetta, Greek and Natural Yoghurt as well as ricotta cheese. 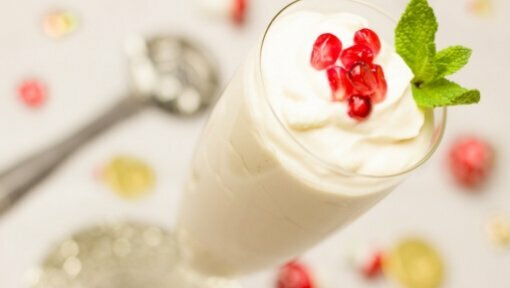 Yoghurt in the Mediterranean diet is often eaten at breakfast or for dessert. You also see many dishes made with yoghurt including the famous tzatziki. It makes a great base for salad dressing or over meat. Greek or Natural varieties are generally unsweetened, and fruit or honey is added later to taste if needed. Your invitation to find out more! Olympus Cheese are proud sponsors of the Mediterranean Diet Expo. We will be attending on the day, and we hope you can come along and say hi to us. We will be joining some wonderful local producers who will be there to introduce you to products and tastes which are available right here in Australia. Sourcing amazing Mediterranean produce made in the traditional way is easy, and Two Greek Girls will show you how. They will also show you how this food is so simple and delicious, with many cooking demos running throughout the day. What’s more, you can hear from a range of health experts on the benefits of implementing a Mediterranean diet. All great reasons to come along and immerse yourselves in our culture. There will also be Greek entertainment, and in true Greek style, plenty of food coffee and wine. For friends of Olympus Cheese – use the code MDE18 at checkout to receive $10 off your ticket price!